Why memory is like a bicycle everyone can ride (with some minor personal adjustments). The real reason why no one should ever be squeamish about memorizing poetry. Why and how some of the most famous memory skills are applicable to memorizing poetry. Effortless methods used by the experts to create easy, effective and elegant "Memory Palaces" for storing poetry (and "stealth" methods that show you how to use them to recall poems right away no matter how long ago you remembered them). Unique techniques that will have you literally "tuning in" on the poetry you read. Exactly how often to recall poetry (a routine that lets people who are brand spanking new to memory techniques to memorize verse quickly and rapidly advance to mastery). A simple strategy for turning boring places you've been into amazing "Memory Palaces" (learn this technique and you will be able to spin any place you visit from now on into "Memory Palace" gold). Two secret ways to use relaxation to aid the memorization process. 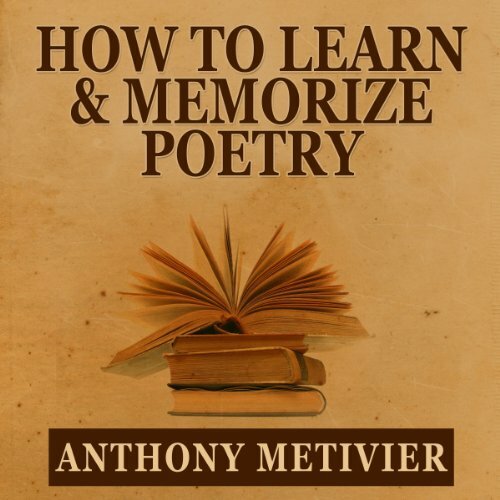 These two methods alone are worth the price of this audiobook because they will literally eliminate stress from your body as you memorize poetry. this guy is a little too busy telling you to make sure and get your friends to buy his stuff to really spend too much time on memory techniques and examples. there are some interesting ideas and some tidbits at the very end, like a movie after credit sequence that you might miss if you stop, after he gets done telling you how great he is some more, but overall not worth the time. sorry. luckily it is short so try it if you want but i think i'd rather look elsewhere. and i have used some memory techniques for test taking that worked great for me, but he doesn't even mention them. and as far as poetry, which is after all in the title, there are almost no examples. Would you listen to How to Learn & Memorize Poetry...Using a Memory Palace Specifically Designed for Memorizing Poetry again? Why? Yes. The specific advice how to build a good memory palace and which mistakes to avoid was very useful.